Dennis M. Sweatt Comic Book Creations and Design! 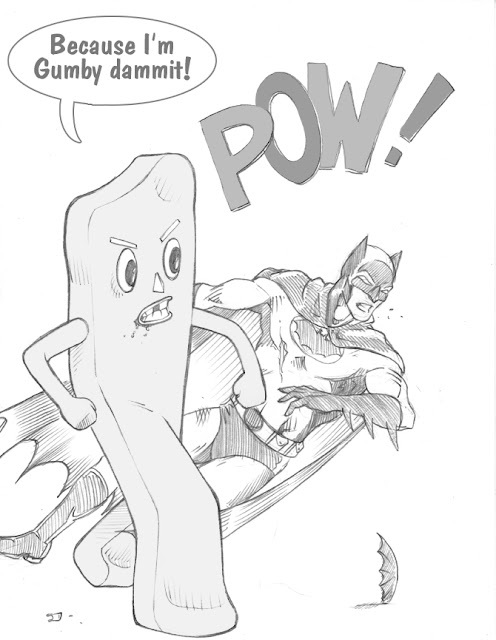 : Gumby Versus Batman! Rivals for the TV audience of the sixties, Gumby finally acts out on his accumulated rage towards the 1960's version of The Batman. As the television parody of the harder Batman we know today, this grandiose hero lacks the true strength of a real caped wonder. After landing one lucky punch resulting in Gumby's broken tooth, Batman will now feel the full weight of what a child's claymation character can do when he is turned into a monster by his falling ratings.